No event in the meet is more of an NCAA Championships Review/Preview than the men’s high jump. Headlining the field are a pair of NCAA Division I champions in 2014 outdoor winner Bryan McBride of Arizona State and 2015 indoor winner Jacorian Duffield of Texas Tech (plus 2014 indoor/outdoor Division II champion Jeron Robinson of Texas A&M-Kingsville), as well as the runners-up in each of the past two NCAA championships. Wally Ellenson of Marquette was second outdoors a year ago (and third indoors this year), while Bradley Adkins of Texas Tech was No. 2 indoors. Add in James White of Nebraska – the fourth-place finisher indoors this year – and you’ve got yourself a field that look an awful lot like an NCAA Championship meet. In what is likely another preview of the NCAA Division I Outdoor Championships, the women’s 100-meter hurdles final could feature as many as five of the top 11 women on the 2015 qualifying list to this point. Chief among them is collegiate leader Tiffani McReynolds of Baylor, back after a sitting out the indoor season with no remaining eligibility. She was fourth in this event at NCAAs a year ago and has two NCAA indoor 60-meter hurdles runner-up finishes to her name. She’ll be up against No. 3 Jade Barber of Notre Dame, No. 6 Cindy Ofili of Michigan, No. 7 Le’Tristan Pledger of Texas Tech and No. 10 Alex Gochenour of Arkansas. McReynolds, Barber, Ofili and Pledger have all broken the 13-second barrier this season, though only only Ofili did so in wind-legal conditions. Again, we won’t be seeing two-time defending indoor 60-meter hurdles champion Omar McLeod of Arkansas make his outdoor debut in the sprint hurdles, but that doesn’t detract from the exceptional field that will take the track. Three men are currently tied atop the NCAA Championships qualifying list, and two of them will be going head-to-head at Drake. Chris Caldwell of Texas Tech and William Barnes of Kent State have both run wind-legal times of 13.56 this season, and will settle their draw (at least temporarily) on the track. Barnes notched his time this past weekend, while Caldwell’s dates back to the Texas Relays in late March. Despite running 13.63 in his next meet, Caldwell has struggled in his past two outings, going 14.02 most recently and 14.54w before that. Those aren’t the only two national contenders in the field. Watch out for No. 4 Aaron Mallett of Iowa and No. 9 Bryce Grace of Baylor. 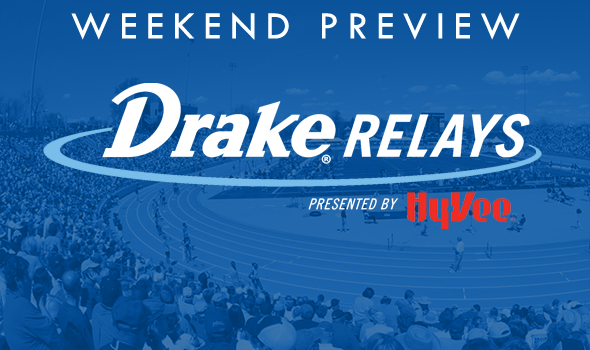 Both races feature contenders for the NCAA Steeplechase crown – one a returner from last year looking to build off an easy debut, and the other a new challenger working on her speed after making a breakthrough 2015 debut. The returning contender is Rachel Johnson of Baylor, who finished third at NCAAs last year and ran her first steeple of the year this past weekend in 10:16.69 – a deceptive time considering she won by nearly 45 seconds. She’s been on fire since that breakthrough NCAA performance, finishing fifth at USAs later that summer, fifth at NCAA cross country that fall, and then runner-up at 5000 meters indoors this past winter. While Johnson had a slower debut last week, that was not the case for Erin Teschuk of North Dakota State. She ran 9:42.83 to win the open section of the Mt. SAC Relays – a career-best by more than 40 seconds. The groundwork for that performance was laid by her phenomenal indoor campaign, including a fifth-place finish in the mile and a seventh-place showing at 3000 meters. She’ll be in the 1500 this weekend, an event in which she’s run 4:17 this year. Like the 110-meter hurdles, this event will be missing the collegiate leader in Trayvon Bromell of Baylor (like Omar McLeod in the hurdles, he’ll be in the relays), but this event will be in no short supply of star power. Assuming all goes according to plan, the finals will feature two men who were among the best of the indoor 60-meter season in Ole Miss’ Jalen Miller and John Teeters of Oklahoma State. Teeters was runner-up at NCAAs in the 60 and the fastest man in the regular season, but has just one 100-meter race under his belt this year: a 10.20 win at the John Jacobs Invite this past weekend. After a third-place finish at NCAAs as one of the most consistently fast sprinters in the country, Miller has gotten off to a slower start in the outdoor season. He most recently finished third at the Virginia Challenge in 10.39, and has gone as fast as 10.34. Just like the men’s competition, expect high-flying action in the women’s high jump as six of the top 11 jumpers of the 2015 outdoor season are scheduled to compete against one another. Headlining the field are indoor DI runner-up Claudia Garcia Jou and indoor DII champion Erica Kinsey of Central Missouri. Both women cleared 6-2¾ (1.90m) at their respective national championship meets indoors, and only one centimeter separates them so far this outdoor season. Kinsey has gone 6-2 (1.88m), while Garcia Jou has cleared 6-1½ (1.87m). Also in the field are No. 6 Marusa Cernjul and No. 9 Megan Glisar of South Dakota.